Today’s post is all about meal preparation and packing healthy lunches! It also happens to be the second part of my post series titled “My Guide to Packing Easy Vegan Lunches”. If you need a refresher (and you might, this post has been a looong time coming), check out part 1: How to Grocery Shop for Packing Healthy Lunches To Go. It’ll walk you through the planning stages of picking out your meals and grabbing groceries for healthy packed lunches. 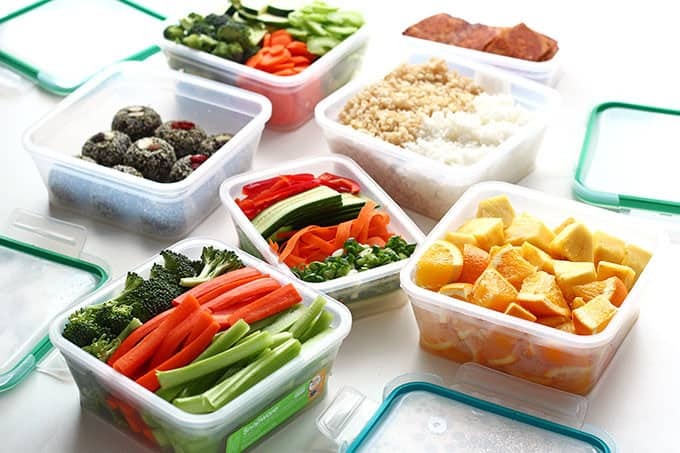 Part 2 is focused on simple ahead of time meal prepping for a wide variety of packed lunches as well as the day-to-day prep required to actually pack a healthy vegan lunch. I’m going to walk you through everything I’ve prepared for 1 full week of healthy lunches. This doesn’t encompass everything I’ll be using in my lunches, just the stuff I think is best prepared ahead of time. I’ve included the estimated time required (based on my own times) and broken it down into active time and total time. If you follow along in a similar order, everything should take you approximately 90 minutes to complete. I’ve included tips for keeping all of your food fresh for the week and linked to any relevant recipes. All the containers pictured here are courtesy of Snapware. I’m using 5 of their 5.35 cup containers and 2 of their 3.01 cup containers. I highly recommend their food storage containers, they’re BPA-free, microwave and dishwasher safe, air-tight and totally leak proof, thanks to the 4 locking tabs. Healthy grains like brown rice or quinoa (yes, we know, it’s actually a pseudocereal) can provide a good base for a wide variety of healthy meals, or can add bulk to lighter options like salads. Cook up a big batch for faster lunch packing all week long. Brown rice will take the longest to prep (at 60 minutes), quinoa is a little speedier (20-25 minutes), and whole wheat couscous is great if you’re crunched for time (approx. 10 minutes). Baked Sriracha & Soy Sauce Tofu is my saving grace when it comes to quick, easy, and healthy packed lunches. Slice a block of extra firm tofu into thin slices (refer to the picture above) to keep your options open and provide you with the widest array of uses. After baking, you can leave the pieces whole for easy sandwiches and quick vegan power bowls, or you can slice it into strips for veggie rice rolls and wraps, or chop it into bite-size squares for salads, stir-fries, or snacking on with crackers. 1 block of tofu = 4 medium servings, so feel free to cook up 2 blocks at once if you please. You’re going to want to wash and prep plenty of fresh veggies for the week. I’ve filled up 3 separate Snapware containers with veggies. One 5.35 cup container is for veggies I intend to snack on raw (celery, broccoli, carrot sticks, etc.) with hummus. I pack all of this in water to keep them fresh and crisp. Cucumber doesn’t hold up quite as well next to the other ingredients, so I chop it up fresh when I’m actually preparing the next day’s packed lunch. For maximum freshness, change the vegetable water daily. The 3.01 cup container is for finely chopped veggies that I’ll use in salads, sandwiches, and veggie rolls (or veggie rice noodle bowls!) These veggies include carrots (julienned, spiralized, or in “peelings”, as pictured), thin sliced cucumber, thin sliced red pepper, and finely chopped green onion. I’d pair these with a bag of prewashed baby spinach or salad greens. I don’t pack these ingredients in water. Lastly, the other 5.35 cup container is for veggies I intend to cook up for stir-fries, power bowls, and easy weeknight dinners (make sure to make enough for leftovers at least once a week!) My cooking veggies are chopped a little differently than my “eat raw veggies”. I do carrot rounds, thin-sliced celery, chopped zucchini, and more broccoli florets. I don’t pack these in water because I find they sauté better when they’re nice and dry. It doesn’t get much easier than packing some pre-washed and pre-chopped fruit for a light, healthy snack. Oranges, grapes, melons, and pineapple are all good “prep-ahead” fruits. Berries are best packed the day you plan to eat them. This week I chopped up 1 whole pineapple and 2 oranges. I like to keep a batch of naturally sweetened date-based energy balls on hand for a sweet yet healthy snack. These are great because they’re versatile, satisfy a sweet tooth, healthy fats and plant-based proteins provide tons of energy, and keep you feeling satisfied. Some of my go-to recipes are: Banana Chocolate Chip Superfood Cookies and Peanut Butter & Chocolate Superfood Bites, but feel free to get a little crazy with your food processor and whip up your own creation! Stick to a ratio of approx. 1:1 dates to nuts for best results. My date-based creations pictured here were a bit of an experiment using about 1 cup dry pitted dates, 1/4 cup hot water, 3/4 cup walnuts, 1/2 cup of granola, a few tbsp of hemp hearts, and 2 tbsp cocoa. Blitz the nuts and granola until very fine, set aside, and then process the dates until smooth. My dates were super dry so I added some hot water. Combine everything together and blend well. If the mixture is too sticky, oat flour, more nuts, or cocoa can help thicken it up. I also rolled mine in hemp hearts to keep them from sticking together. Store in your fridge or freezer. If you include any extra fats like coconut oil or peanut butter, they must be served chilled or the fats can separate making them seem a little greasy. Now it’s time to break down the actual lunch making process. Feel free to play around with your lunches as much as you like. This is just a general guideline to help you use up your prepared ingredients in such a way that nothing is wasted, and offers some much needed variety. Here I’ll break down each day, into 2 snacks and 1 lunch. I’ve included explanations of the food storage sizes you’ll need, and exactly what preparation needs to be done on a day-to day basis. Any lunch can be subbed for leftovers from the previous nights dinner or a simple meal of rice + Sriracha & Soy Sauce Tofu + sautéed or steamed veggies from the “cooking ingredients” vegetable container. I’ve also linked to any relevant Food on the Go posts from my food journal, Garden of Vegan, on tumblr, for a little extra inspiration! Containers required: 2 small (1/2 cup) containers, 2 medium (1 cup containers), and 1 large (2.5+ cup) container + 1 fork. How to pack this lunch: Snacks – Pack hummus in 1 small container. Pack energy balls or trail mix in 1 small container. Pack 1 medium container full of fresh veggies and 1 medium container full of fresh fruit. Noodle Bowl – Fill the large container with rinsed rice noodles, mixed with a liberal amount of peanut sauce, top with your choice of finely chopped vegetables from the prepared veggie “toppings” container, and 1 serving of baked tofu, cut into thin strips. Pour a little extra spicy peanut sauce on top. Containers required: 2 small (1/2 cup) containers, 2 medium (1 cup containers), and 1 large (2.5+ cup) container + 1 fork and 1 knife. How to pack this lunch: Snacks – Spread celery stalks with peanut butter and sprinkle with raisins – pack in 1 medium sized container. Pack 1 medium sized container full of fresh fruit. Pack 1 small container with trail mix or energy balls. Salad – Fill 1 large container halfway with spinach. Top with 1/2 cup+ brown rice (or quinoa) and 1 serving of Baked Sriracha & Soy Sauce Tofu (cut into bite-sized squares.) Feel free to bulk up your salad with ingredients from the prepared veggie “toppings” container + hemp seeds, pumpkin seeds, or canned/drained chickpeas. Plastic wrap 1/2 avocado (you’ll add this to the salad when you sit down to eat.) In 1 small container, pack your choice of dressing to accompany your salad. Containers required: 2-3 small (1/2 cup) containers, 2 medium (1 cup containers), and 1 large (2.5+ cup) container + 1 fork and 1 knife. Vegan Power Bowl – Fill 1 large container with 1 cup+ rice, a big handful of spinach, and 1 serving of Baked Sriracha & Soy Sauce Tofu. Sauté or steam your choice of veggies from the prepared “cooking ingredients” (make sure to season them to your liking!) and add them to the container too. Optional: Pack a little extra hummus, 1/2 avocado, or a small container of peanut sauce to add to your vegan power bowl. Containers required: 2 small (1/2 cup) containers, 1 medium (1 cup containers), and 1 large (2.5+ cup) container + 1 knife. How to pack this lunch: Snacks – Fill half of 1 medium sized container with non-dairy yogurt and top with fresh or frozen berries. Fill 1 small container with granola (bulked up with extra nuts or seeds if you like.) Fill 1 small container with peanut butter and pack an apple. Sandwich – Make yourself a sandwich (or a wrap) with hummus, Baked Sriracha & Soy Sauce Tofu, veggies from the prepared vegetable “toppings” container, spinach and avocado (optional), and your favourite condiments like mustard or vegan mayo. Sandwich tip: Tuck watery ingredients (like cucumber), into the very center of your sandwich and use ingredients like the hummus, tofu, and spinach to shield the bread from getting soggy. Store your sandwich in 1 large food storage container. How to pack this lunch: Snacks – Pack hummus in 1 small container. Pack 1 medium container full of fresh veggies. Pack 2 small containers, 1 with sliced pickles, and 1 with Baked Sriracha & Soy Sauce Tofu (cut into bite-sized pieces). Pack 1 medium sized container full of crackers. Sandwich – Spread 2 slices of whole grain bread with a thin layer of peanut or almond butter. Slice up an apple or banana and spread it out on 1 slice of bread. Top with a sprinkle of cinnamon and hemp seeds, and the other slice of bread. Store in 1 large food storage container. There you have it! A full week’s worth of healthy lunches and snacks. I hope you find this post helpful, I’d love your feedback so please leave a comment below if you’d like to see more posts like this! This post is sponsored by Snapware. We love their high quality, no-spill food storage containers that help make healthy eating easy! Learn more about Snapware below, or by visiting their website, www.snapware.com. Thanks for supporting the brands that support I Love Vegan! This is an awesome post. I need more veggies daily. So great! I just made a bunch of recipes from this post yesterday. The energy balls are soooo good! I love them. I also made the peanut sauce, braggs and sriracha tofu, and went ahead and cut up a whole pineapple and a bunch of raw veggies. I gotta say prepping is the way to go. I have tons of healthy stuff on hand. Thanks so much for this inspiring post! Yay!! Thanks Emily, your meal prepping sounds fantastic. Your comment reminded me that I need to get back to meal prepping again. Thanks! Thanks!!!! Theres some really useful tips here!! This wonderfully comprehensive super post leaves me with no more excuses. Flavourful recipe ideas of all sorts (even for my sweet cravings), easy preps, and beautiful storage/travel containers. Living life as kindly as possible just got a whole lot easier , and even more scrumptious . Thank you Brittany. What a great and informative article. Thank you so so much Cheryl! You always leave the best, most encouraging comments. 😀 THANK YOU!! My first month as a vegan and I found this post so helpful. Thank you for this! Definitely going to share it with my friends. Super helpful stuff! I’m just wondering hopefully I didn’t miss this but do you put the containers in the fridge or the freezer? I’ve now done this for two weeks in a row, and I can honestly say that you’ve changed my life, Brittany. I’ve never had a handle on packing lunches, or even buying properly in preparation. Even my omni hubby has been pleased to have such an increase in fresh fruit and vegetables in our meals. Totally a keeper. Thank you. Awesome info : ) I so new to this but learning more everyday! Can you please show pics of your lunches/snacks after packing is done like you did for the prep pics? Thank you! This post was s helpful if basically brought me to tears of joy! I’ve been so frustrated with trying to navigate the world of meal prepping but this vegan / healthy/ no fuss way about it made me so happy and hopeful for a successful attempt and prepping snacks and lunches this week! Thank you so much for sharing your insight! Yay! That’s great to hear 🙂 I hope you find that meal prepping works for you – I think it’s just a matter of finding a way that YOU like. Thanks for commenting Carolina! Hi Catherine! Personally, I’d go for about 5 days. You could always freeze the rice if you’re concerned! Wow thank you so much! This is such an informative post. I’m new to the whole-food, plant-based scene but not the meal prep scene. I got a little overwhelmed yesterday trying to prep my meals for the week. I just found this post and I’m wishing I found it earlier. But that’s OK! I’m excited to do this this weekend! Thanks again! Do you have any other ideas for sauces to use to maybe switch it up every now and then? Are you looking for a sauce to eat with the veggie rolls specifically? I’m wondering about breakfast and dinner, do you prep those meals too?